Coffee and liquor both have heating effect in the body. Especially when we are stressed out, drinking coffee or alcohol can trigger the secretion of adrenaline in which can manifest the emotions that we are feeling. How does this relates to skin infection or rashes. 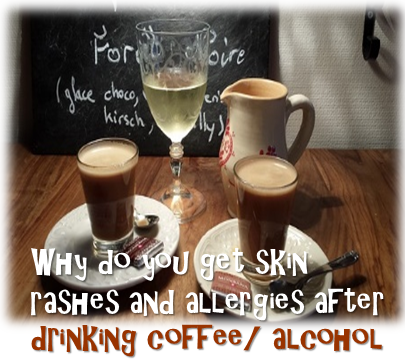 Why do some people find their skin having more rashes on days where they are more stressed and drink more coffee than usual? Or they seemed to develop rashes from drinking a glass of wine. Coffee and wine (alcohol) are considered heaty drinks. They bring with them hot energy – and excessive consumption causes an energy imbalances in our liver. That is why those who drink a lot of coffee may find themselves irritational, easily angered, more stressed and jittery. Skin rashes usually indicate excessive heat energy in the body. One of the body’s way of trying to disperse the heat is to cause skin rashes to form. As the skin is also sensitive, it may be surceptible towards skin infection. When normally our immune have no problem fighting the condition off of infection, the element imbalance may upset the internal environment causing our white blood cells not to be working well. Many people tend to treat the condition by applying steroid-based creams in an attempt to relieve the condition. By applying creams, one may mask the condition and at worst, disabled the body’s attempt to discharge the heat off. Furthermore, the liver also had to work hard in an attempt to get rid of the toxins from caffeine and alcohol- and trying to repress these symptoms may cause the toxins to be moved further into the organs since the body is not able to discharge them. One can try to take cooling food- and by cooling food I do not mean the refridgrated version. Many sites such as this one provide the listing of cooling food you can take. You may ask then how about iced coffee? From traditional Chinese healing, iced drinks are very detrimental for health. The sudden difference in temperature sends a shock to our body and taken together with food causes the digestive system to be sluggish- giving rise to acid reflux, bloating and indigestion. Emotions also play a role in why skin rashes occur. We may notice that we can more surceptible to skin rashes when we are particularly stressed. We may wonder why our skin condition does not flare up all the time but seems to be related to our emotion and stress levels. The food and drinks we consume can amplify our condition- especially with coffee, the most legalised drug in the world. As our skin represents our boundary, it could be related to emotions of annoyance, irritation, supressed anger. For example we felt our boundaries have been intruded but we could not stand up to it- so skin ‘say no’ for us- sometimes the rashes can get so painful (tied to anger and annoyance) that cause us unable to focus on work. And because the physical symptom is obvious, whoever disturbing us may tend to back off or we may take sick leave to get treatment for it. The condition is gets further amplified because the effect of coffee causes imbalances in our liver that manifest into the emotion of anger. working out, exercising is good because sweating helps cool our body down and relax our mind.